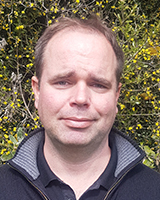 Mike Cripps is a scientist at AgResearch Lincoln, New Zealand. His research is primarily focused on pasture weed management, with an emphasis on classical biological control, and a current focus on thistle weeds. Before joining AgResearch in 2012, he gained substantial experience in biological control of weeds from research carried out in North America, Europe, and New Zealand. His research has involved testing plant invasion mechanisms and underpinning theory of biological control of weeds by comparing invasive weeds in their native and introduced ranges. Mike currently serves as vice president of the New Zealand Plant Protection Society.